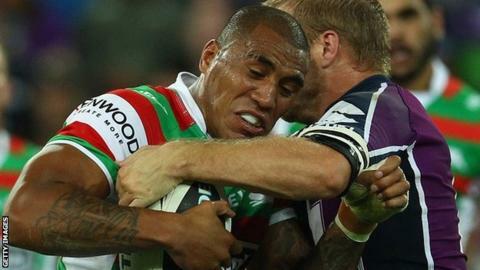 Hull FC have made former South Sydney Rabbitohs back Fetuli Talanoa their sixth new signing for next season. Subject to being granted a work permit, the Tonga international has signed a one-year contract with the Black and Whites, with an option for 2015. Talanoa, 25, scored 40 tries in 95 appearances for the Rabbitohs between 2006 and 2012 before suffering a life-threatening bout of pneumonia. "For me it's about getting back into playing rugby," he told the club site. "Rugby league is where my heart is and that's what I enjoy doing but first of all, I've got to make the team and that's a battle I'm really looking forward to. "I want to take this opportunity with both hands and reward [Hull FC head coach] Lee Radford for giving me and my family the chance to come over." Talanoa follows former rugby union international Tom Biggs, Tonga's World Cup forward Mickey Paea, ex-New Zealand prop Feka Paleaasina, Wigan forward Chris Tuson and utility player Jordan Thompson in moving to the KC Stadium in 2014. Radford said: "Fetuli was quite a player in the early part of his career, very strong, quick and powerful and someone that can play numerous positions, so it was surprising, although understandable, when he chose to take a period away from the game. "I know a number of other clubs have been keeping tabs on him following conversations with agents and coaches over the last few months, particularly Brisbane who have looked at him a couple of times, so to come out on top despite competition like that it is very pleasing. "I think Fetuli sees this as a bit of a life change. He could have stayed in Australia but he has decided to make the most of the opportunity, experience life on the other side of the world with his family and embrace a new chapter in his career. "That's why this is very exciting for us. He is very hungry and eager to impress and hopefully we will reap the rewards of that."